This is the Ultimate Hulk of the Avengers Heroclix set. Of all the Hulk Heroclixes I’ve seen, this is probably one of the best out there. The only competitor that comes to my mind is the Red Hulk figure released as part of a Spiderman set. The sculpting on this is truly amazing. Incredibly detailed. The pose is almost exactly like the panel from the Ultimates comic. The paint job is also above and beyond other figures. This version of the Hulk is truly blood thirsty, angry as hell and incredibly horny. You have been warned! He hails from the now extinct Ultimate universe. This is a rare figure to find, but if you do I highly recommend grabbing it. That being said the price for it on ebay is around $10 as of this writing. Even though I know this blog is called ‘Green’ fists…any true Hulk fan knows our angry friend isn’t always…green. When the Hulk first exploded onto the scene he was grey. 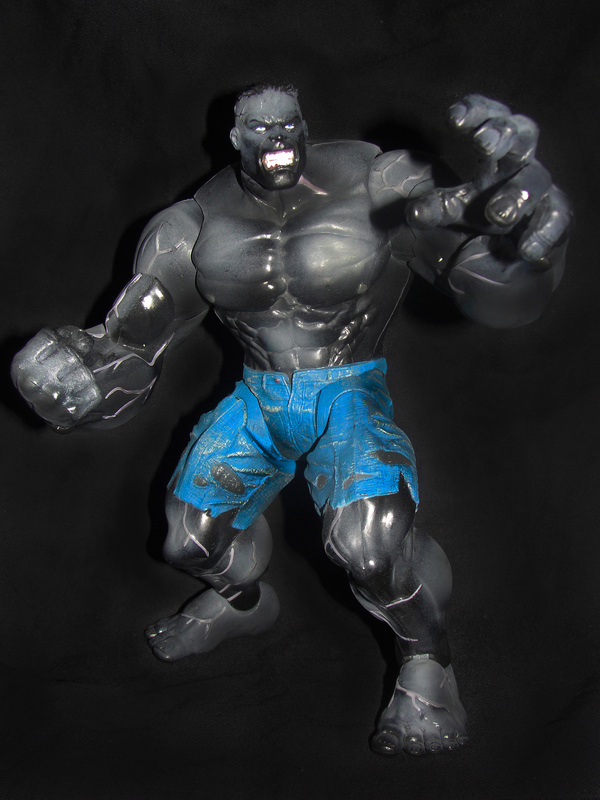 So for the first time on this blog let me introduce Grey Hulk. But this isn’t just any grey hulk. This is the grey hulk from the ultimates universe. I figured since the new Marvel Knight’s dvd features the Hulk from the Ultimate universe we should stick with it for awhile. This Hulk is much more ferocious, clever, and incredibly deadly. In the comic, ‘The Ultimates’, Hulk is on a rampage upon which he steals the pants off a fat corpse, drinks a tanker truck full of beer, and proceeds to kill Freddie Prinze Jr. while being sexually explicit with Betty Ross. This is not the Hulk from the Saturday morning cartoons and the Avenger’s movie. But this Hulk is not without his softer side which comes out from time to time. If you have seen the older animated film “The Ultimate Avengers” then you have an idea of the ferocity and the basic premise of the Ultimates comic. Getting back to the figure…this guy is fairly big (but not huge). His sculpt is also mostly hollow, not lending much to weight. The sculpting is somewhat plain with relatively little detail. The paint job is decent in the shading department though. Also his joints and points of articulation are limited. His pose is limited to variations of what you see in this image. If he weren’t the only grey hulk in the marvel select line to date I probably would not have purchased him. But since he is, and the Hulk was originally grey I could not ignore him as an addition to my collection. He is from the Marvel Select series 3 (2011). I purchased him loose, with minimal signs of use, at around $15. Feeling a bit dry on Hulk media? Comics not doing it for you? Can’t wait for the new Hulk animated series? Well until that show smashes onto the air, and the Hulk and IronMan team up in December, Marvel is releasing more Hulk in September. 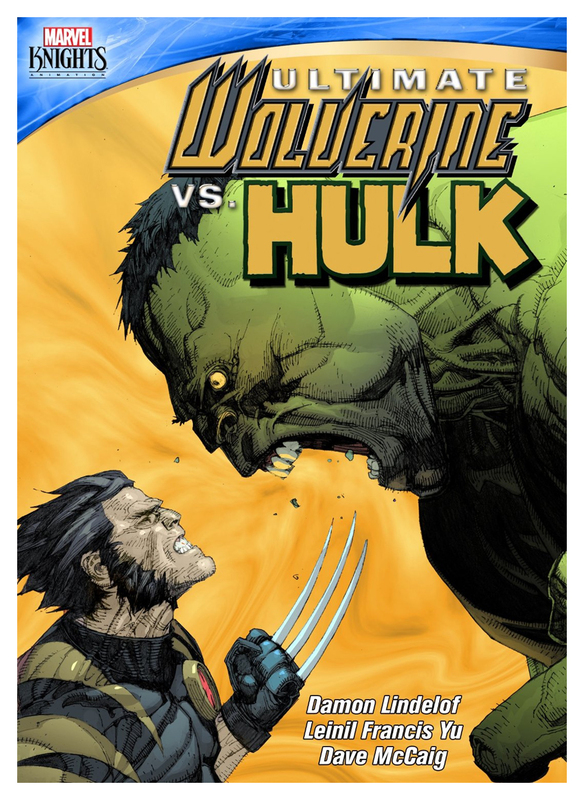 From the Marvel Knights comes Ultimate Hulk versus Wolverine. The highly rated comic will become animated and voiced over. This is truly a fan favorite for both Hulk and Wolverine fans. The DVD is expected to be released September 10th, 2013. It will include bonus content and collectible packaging. This is truly the best time to become (or continue to be) a Hulk fan. For years I walked about as a fan with only one or two subpar Hulk films, an old 90’s animate series, and the fairly popular (though not exactly canon, and cheesy) live action tv series. However, since the Avengers ,and the runaway success of the Hulk, more and more appearances are being made of the green rage monster. This is both great, though potentially a headache, for the die-hard fans. As everyone should know by now that once something is loved enough by millions…Hollywood will work to cash in on it…and in doing so will most likely ruin it. Plenty of times I have smacked my forehead in frustration. Why? Why would you have him do that!?!?! Thats not how it is!! RAARRRHHHHH!!! However, with this new film being essentially an animated port of the comic…the true spirit of both characters will probably stay true to their fans. I can also only hope that this move by Marvel is a way to test audience’s interest in a potential live action Marvel cross over of Hulk and Wolverine. With word of a Batman/Superman movie in the works…Marvel better get in on this..and fast!